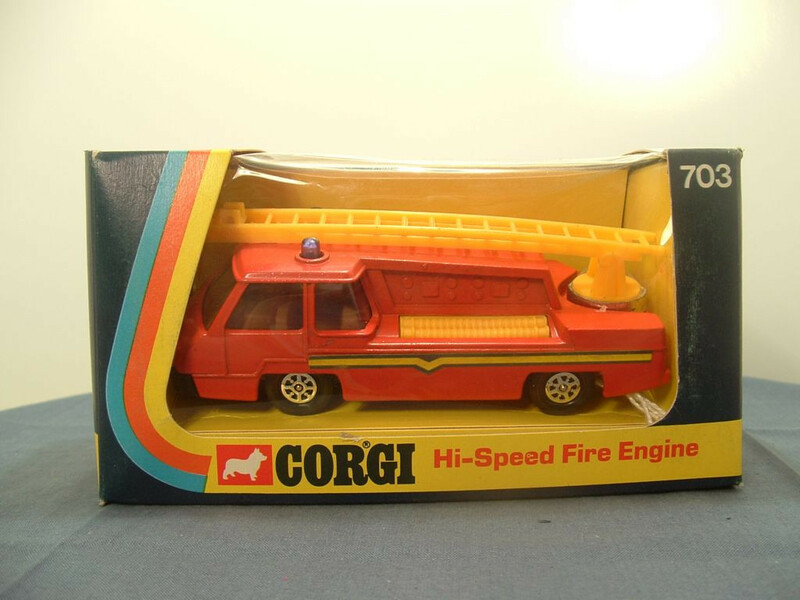 This model is the Corgi 703-A-1 Hi-Speed Fire Engine in red with orange-yellow ladder. There are no opening parts on this futuristic model. The front has an orange-yellow plastic grille and headlights over a black bumper. 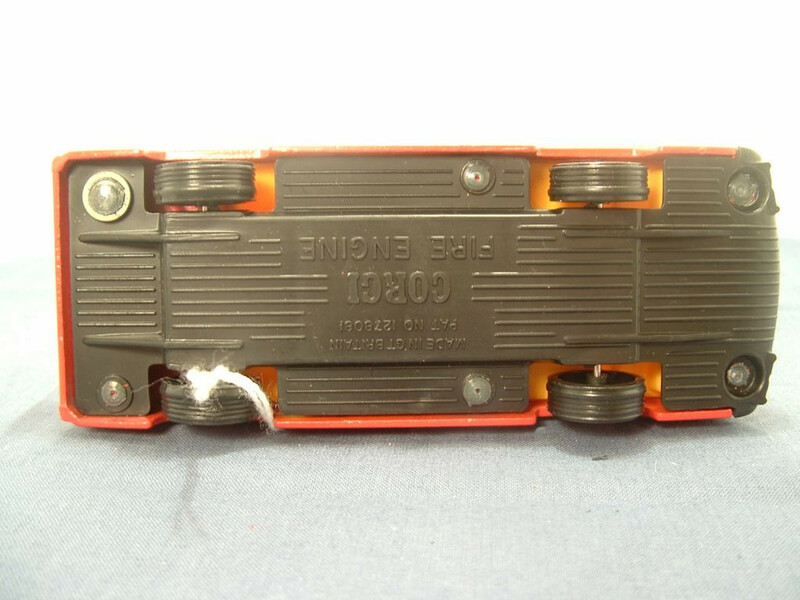 On both sides, below the rear body line, is a paper label with orange-yellow and black lines. Above this, on the rear body are orange-yellow plastic hoses, either side of the gauges and roller doors. 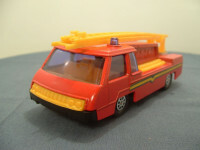 To the rear of the rear body is a swiveling extension ladder, again in orange-yellow plastic, the front of which, when folded, sits between two blue roof lights, positioned over the cab. This swiveling ladder also swivels away from the rear body on a chromed base. At the very rear, the tail lights are painted raised domes. The interior of the cab has mid brown plastic seats and steering wheel, the latter being mounted in the centre of the cab. The glazing is a clear unframed windscreen with very slight blue tint. The wheels are "Whizzwheels" - Hollow black wheels with 8-spoke chrome hub inserts. They are fitted to steel axles that pass through the base. 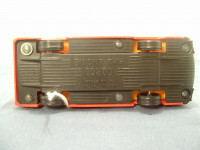 The base plate is black plastic and has the front bumper incorporated int oth e casting. It is marked with "Made in Great Britain, PAT No 1278081" to the centre top, CORGI i nthe centre middle, and "Fire Engine" at the centre bottom. The base plate is held in place with six machined rivets, front, middle, and rear. 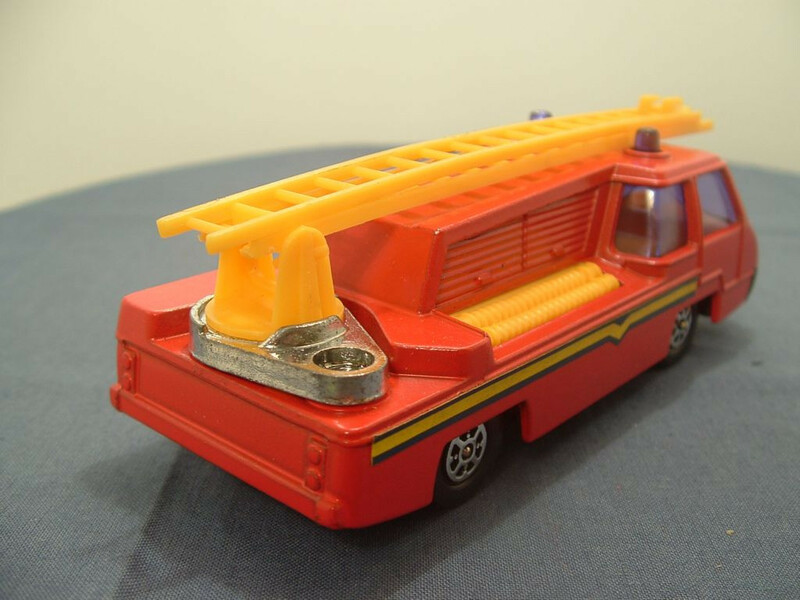 The rear right rivet also fixes the ladder swivel in place. This model was issued between December 1975 and was withdrawn in 1978. A total of 268,000 were sold with a retail price of only 80p.